There has been constant shortage of trained staff. Keeping this in mind, Rehabilitation Council of India has allowed the Society to start 2 years Diploma course (D.Ed) in special education which is in operation since 2011 with yearly intake of 30 students. Also Rehabilitation Council of India has sanctioned 30 seats in B.Ed (Special) and it has affiliation with Punjab University, Chandigarh. Its first session was started from August 2014. This is the first such institution of Punjab University in state of Punjab. The school/institute has also the facility of hostel for girl students on D.Ed & B.Ed classes. Hostel is well furnished air condition. Fee concession is provided for school as well as hostel to the parents of special children who cannot afford. 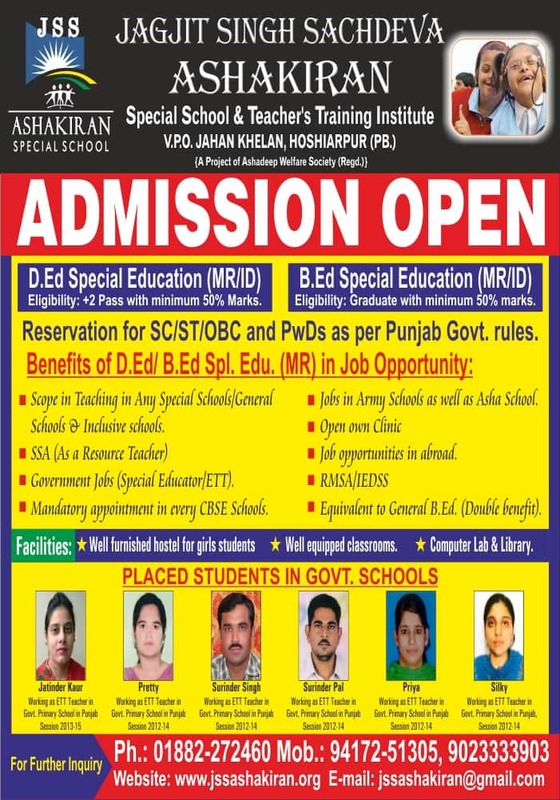 The society has planning to start D.Ed special in ASD & CP from next session. Similarly starting M.Ed special (MR) is also under process. We are also in search of place for starting special school for Hearing and Visual Impaired children because this facility is not available in this part of Punjab and Himachal Pardesh.